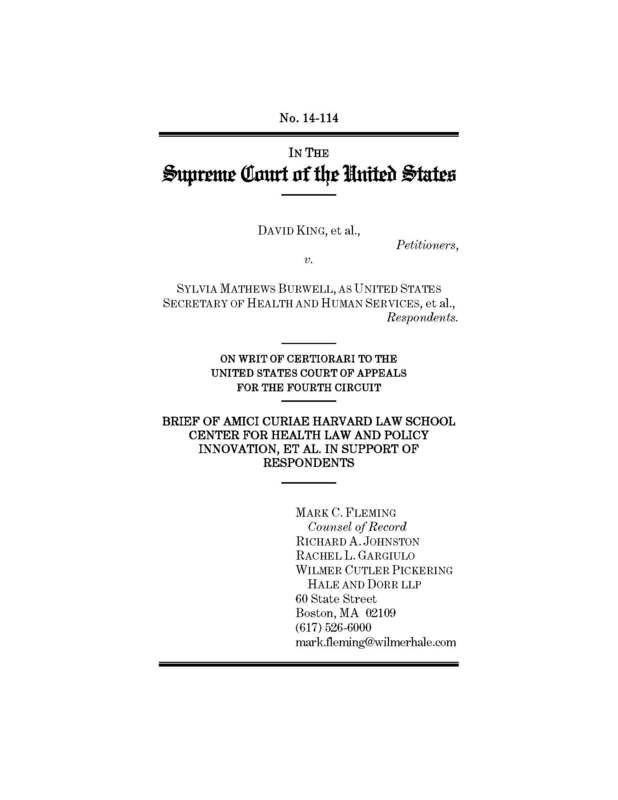 In an effort to support the provision of federal subsidies for purchasing health insurance for low-income individuals in all States, the Harvard Law School Center for Health Law and Policy Innovation spearheaded the filing of an amicus brief in the U.S. Supreme Court. The brief requests that the Court affirm a court of appeals decision upholding the nationwide provision of federal subsidies under the Affordable Care Act (ACA). The 43 non-profit organizations signing onto the brief, including AIDS United, HIV Medicine Association, and National Alliance of State and Territorial AIDS Directors, serve populations that are deeply affected by the ACA’s expansion of health insurance access, including over two dozen organizations dedicated to addressing the needs of people living with HIV and AIDS. The brief highlights the voices of individuals with the most at risk in this Supreme Court case — those who rely on the federal subsidies to access meaningful health care coverage. The Harvard-led brief presents substantial studies and data that demonstrate that federal subsidies are critical to accomplishing Congress’s goal of achieving near-universal health insurance access under the ACA. Included in the brief are personal accounts of individuals who, because of the subsidies, were finally able to access affordable insurance on the federal exchanges and obtain needed health care services with the help of subsidies. The brief also demonstrates that eliminating subsidies in States where federal exchanges operate would harm vulnerable populations, middle- and low- income households, and higher-earning households alike. Using evidence from Massachusetts, the brief shows that expanded health insurance access has a demonstrable effect in controlling the HIV epidemic and improving individual health outcomes. Congress’s adoption of subsidies and private health insurance reform has created a national capacity to both replicate Massachusetts’s successes with ongoing epidemics such as HIV, and to strengthen public health. The brief also highlights that the challengers’ proposed interpretation of the ACA would harm the Nation’s ability to resist and fight epidemics and other emerging public health threats. The brief argues that, by depriving millions of people access to health insurance, a victory for challengers would negate these public health gains in a majority of States, thwarting national efforts to promote public health security to the detriment of the entire population. 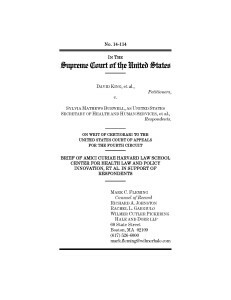 The amicus brief was prepared by the Harvard Law School Center for Health Law and Policy Innovation and WilmerHale.